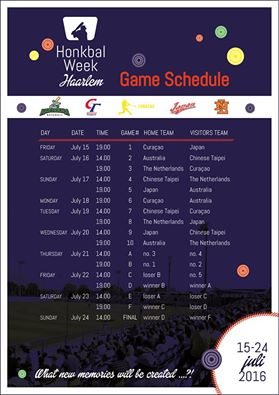 The organizers of the 28th Honkbal Week Haarlem (July 15 to 24) released the schedule for this year’s edition. It all starts on Friday, July 15 at 7pm with a matchup between Curacao and Japan. On day two Australia, Chinese Taipei and the Netherlands enter the competition. The first round will be played through July 20. Afterwards the playoffs will determine through three days the two finalists, which will square off on July 24. All games will be played at Pim Mulier Stadium in Haarlem, Netherlands. Japan is represented by the Collegiate National Team which played 5 games of 42nd U.S. vs. Japan Collegiate All-Stars Series in the U.S. from July 3 to 9 and flew from U.S., to Netherlands to join the Harlem Baseball Week.